There are five pipe openings around the bottom circumference of the boiler. These openings allow piping connections to the bottom of the boiler to be extended outside the boiler. Each of these openings had to be detailed on a drawing for the sheet metal fabrication technician. In addition a pair of holes in the wall of the superheater ring was required for the passage of the superheater piping. In addition to everything happening with the superheater ring it was also necessary to insure that the pilot access door of the burner and the burner’s fuel connections were also properly positioned under the boiler. The drawing above combines all this information into a single document. For simplicity and easier understanding, the drawing is drawn exactly as everything fits in the car. The left side of the drawing is where the condenser (radiator) is located. To the right in the drawing would be the car’s firewall. The bottom of the drawing is the left side of the car. The un-dimensioned area between three and four o’clock is where the pilot access door is located and this position dictates the burner’s position. 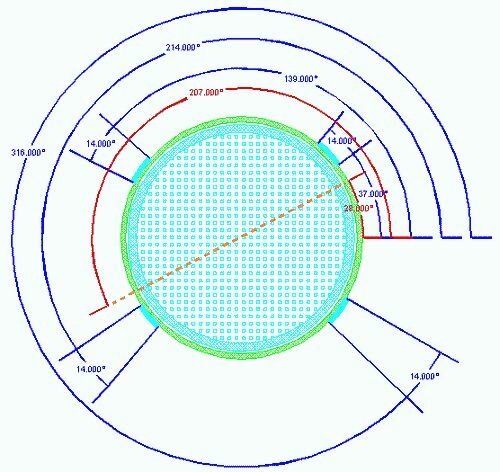 The dotted line between two and eight o’clock represents the path of the superheater piping through the superheater ring and thus this line dictates the superheater ring’s positioning.